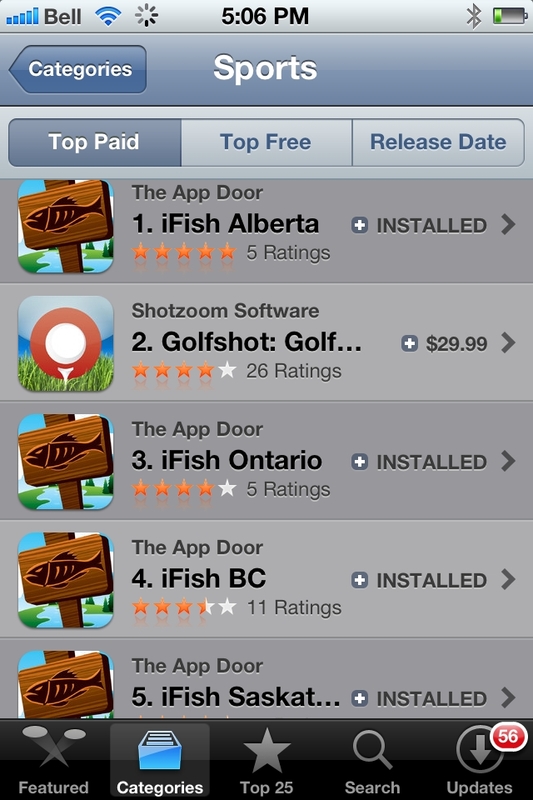 We managed to get all 4 iFish apps in the top 5 sports apps in all of Canada! We’ve recently added several contour maps to many popular lakes in Texas. Many include, depth and local area information as well. If you have an article or recipe you would like posted into iFish, send it to us for review. If its really good, you might just get some cool gear from us! Why is there no iFish Manitoba, Quebec, & Atlantic Provinces? We plan on adding them all. We are working on data collection for additional provinces. This is not an easy process (or everyone would be doing it) So we would rather take our time and provide quality apps, rather than just getting them out there. We certainly plan on adding rivers and streams to the iFish Series of Apps. 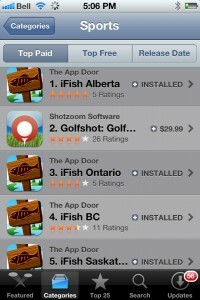 We launched the iFish series with Lakes only since the data was much easier to process and display within the apps. As an example where would you drop a location marker for a long river like the North Saskatchewan River ? This and several other hurdles are being dealt with in the coming year. We will keep you posted on this as we progress. We’ve added the 2012 ACA Rainbow Trout Stocking List. This is as of May 22nd. You can find it in the “Books, Mags & More” Section under the Essentials Tab. Check out our TV Commercial with Bob Izumi – it’s played Nationally on the Global Network. When is iFish for Android available? We’re trying for this summer to release of the Android version of the iFish Series of Apps. This has been taking longer than we expected, but we are almost there. Thanks for everyone’s patience – You won’t be disappointed.